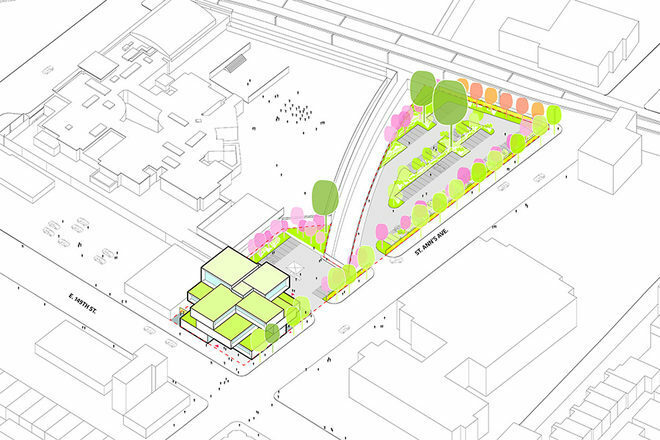 The perforated design of the community space is supposed to give a feeling of openness to the community. 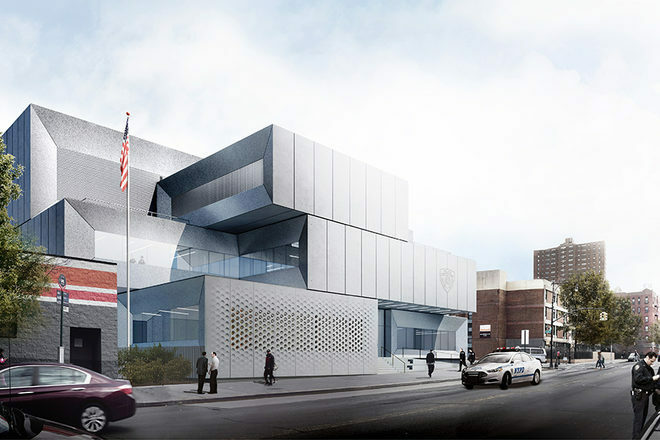 Two weeks ago we reported on the artist selection process for the permanent public art for the new 40th Precinct which was held at The Bronx Documentary Center. During last week’s presentation, we got a look into what the new 40th Precinct would look like slated for construction at its new location on 149th Street and St Ann’s in Melrose. The design itself is that of stacked blocks centered around a common atrium, with each block serving a specific purpose. Each rooftop will be green with plantings but what will make this building unique is the dedicated public community room. 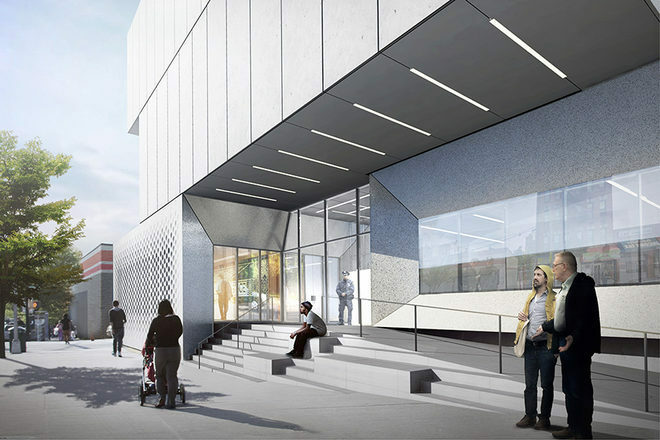 The artists’ presentations last week focused on their vision for the community space but also took into account portions of the exterior space. 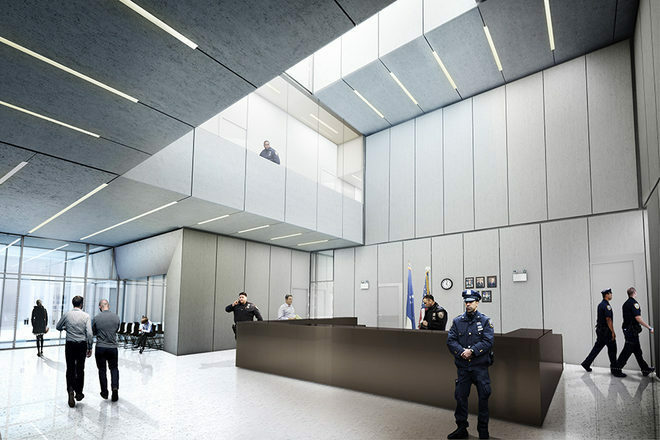 They also envisioned what the room could potentially function as which is not as easy as it sounds due to the fact that this is unprecedented in New York City and the 40th Precinct will be setting the tone for the future of what NYPD precincts can look and function as. The new design allows for more interactions with the community in a friendlier and more accessible manner (no, not for more incarcerations and I’m the biggest skeptic of such concepts). The ability for the community to have a place of its own within will indeed have an impact on a neighborhood where there have been major strains with the NYPD and hopefully this is a step in fostering conversation and healing between the two. Such is the power of architecture and design when done in a conscious manner. Architecture can be that conduit. And that’s where the permanent public art commission comes into play. 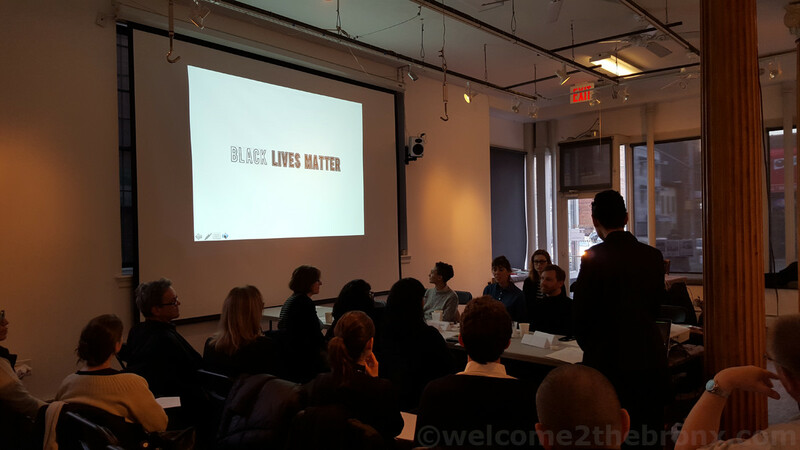 After 5 hours of presentations and deliberations over the pros and cons of each artist’s proposals, with considerations to the community and advisory panel’s recommendations, the main panel was split on two artists. Percent for Art, a division of New York City’s Department of Culture who’s handling this process and the commission eventually decided to split the commission between Borinquen Gallo and Paul Ramirez Jonas due to the strengths of both their proposals. Both artists have experience in having worked in The Bronx and Gallo has the distinction of being raised here (and still living in our borough) after moving with her family from Italy to the South Bronx in 1988. Paul Ramirez Jonas envisioned a community room that would be sort of a satellite of an existing Bronx institution like The New York Botanical Garden among the several he listed (Note: this was just simply conceptual and no institution had actually been contacted). Borinquen Gallo took the opportunity to do some on the ground research to develop her vision by not only interviewing NYPD officers at the old 40th but also residents who walked by the new site. This helped formulate a vision that came from common ground found on both sides of the NYPD and community equation. 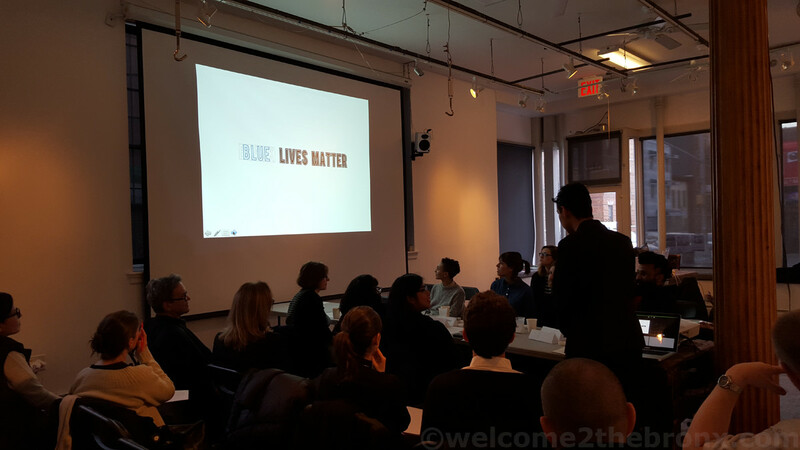 A controversial component of Gallo’s proposal was a neon sign she envisioned that would read ‘Black Lives Matter’ on the outside where the NYPD hold their briefings before each shift and on the inside the same sign would read ‘Blue Lives Matter’ for visitors to see. The expectation is that this would be a way to foster communications between the community and NYPD. Artist Borinquen Gallo envisions a sign that reads Black Lives Matter or Blue Lives Matter depending whether you’re looking at it from the inside or the outside of the precinct. Given the two 40th precinct police officers shot last week at Melrose Houses, this artist couldn’t have been a better pick. For the same reasons, this entire project just took on an even more important meaning as it is quite clear that we have much work to do. Having the first community space in a precinct and community working side by side with the NYPD in a shared space is but just one of many steps in that direction.